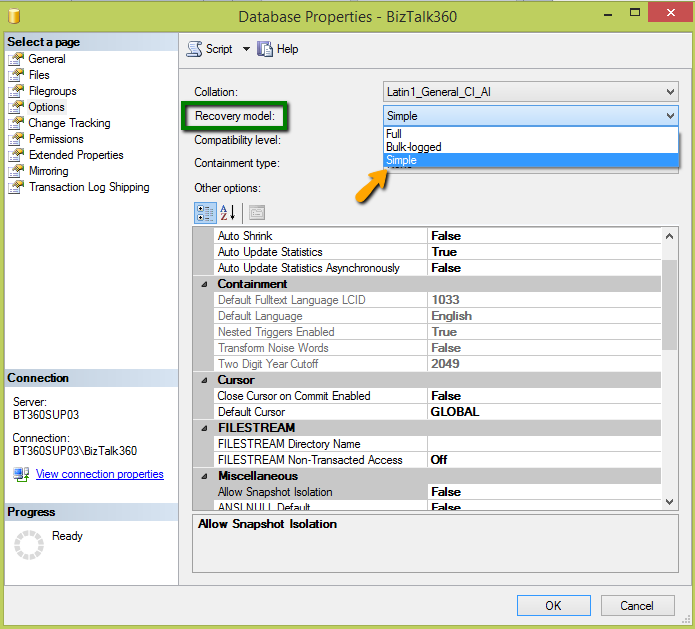 In order to function properly, BizTalk360 requires read access to certain tables in BizTalkMgmtDb (BizTalk Management Database). The required permissions can be viewed in the download page http://www.biztalk360.com/free-trial. Recently one of the customer raised a support call saying, he cannot see some of the tables (dbo.adm_OtherDatabases, dbo.adm_Server2HostMapping, dbo.adm_ServiceClass, and dbo.BizTalkDbVersion) listed on our download page using SQL Management Studio, and BizTalk360 is complaining about the non-existent tables in BizTalkMgmtDb. 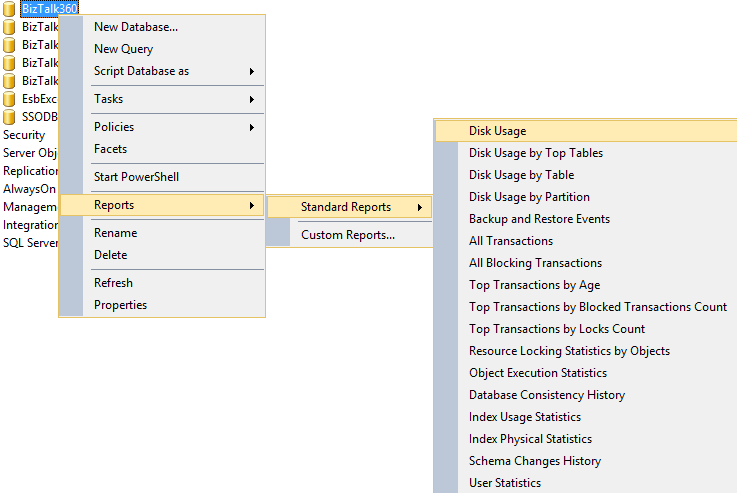 The reason you cannot see certain table using SQL Management Studio is because the user may not have appropriate rights. If you take a look at the below picture, you can notice the user access on the LHS is part of the standard "BizTalk Server Operators" group and the user access on the RHS is part of the standard "BizTalk Server Administrators" group. 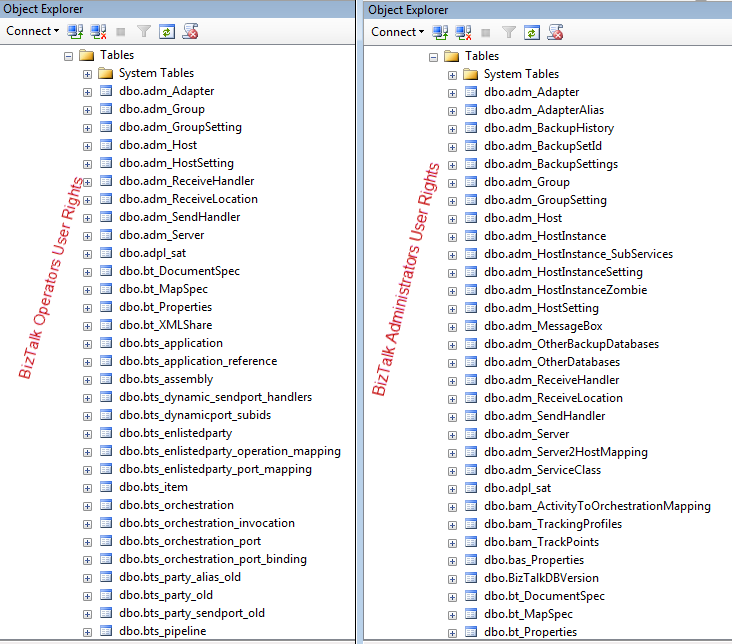 If you notice closely, you can see there are certain table missing on LHS (dbo.adm_ServiceClass). There may be occasions when you face performance issues while trying to call the stored procedure(s) that result in a timeout error. The reason for this timeout error is due to the size of the BizTalk360 database. Generally, the BizTalk360 database does not contain any environment related data, but mainly has the information about the BizTalk360 configuration settings, monitoring details for dashboard, log data, and few additional information like alert history, environment settings, and so on. We have seen one instance where Windows Authentication was used and even after providing all the required permission (sysadmin) level, the error message persisted. We resolved the problem by creating a brand new windows account, added the account to all NT groups required by BizTalk360, assigned BizTalk360 IIS application pool to the newly created user, added the SQL Login for that user, with user mapping point to BizTalk360 database. We also noticed a situation where the original user was deleted and then recreated again. Since the SID of both the accounts will be different, SQL server will throw security exception. You can verify this by opening SQL Management studio using that particular user account, and try to access the database. SQL server will throw an exception "The database is not accessible (ObjectExplorer)". You can fix this by assigning ownership of the database to the user again. If your SQL transaction log-file is taking lots of space, follow the steps as shown below to bring down the size of the log file. The first step is to carry out a check to find out how much of disk space is being used by the transaction log file. Verify the transaction log space usage. If you find a huge percentage of unused space, you need to shrink the size of the transaction log file to release unallocated space. 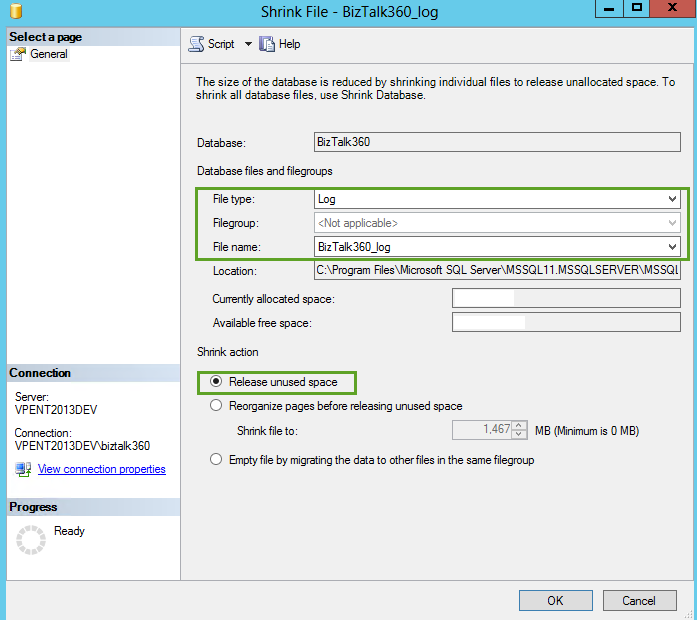 Refer Section 2 for the process of shrinking the transaction log file size. Select the Release unused space radio button. Selecting this option causes any unused space in the file to be released to the operating system and shrinks the file to the last allocated extent. This reduces the file size without moving any data. You can also create a SQL script for shrinking the transaction log file and execute the script. From SQL server 2008, the below command has been Discontinued. The transaction log is automatically truncated when the database is using the SIMPLE recovery model. If you must remove the log backup chain from a database, switch to the simple recovery model. 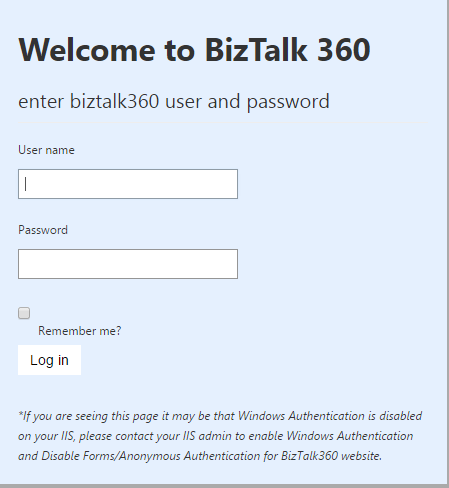 There may be times when you notice BizTalk360 requesting for login credentials as shown below. This error is mainly because "Anonymous Authentication" is set to Enabled under IIS settings. Follow the steps as shown below to rectify this problem. 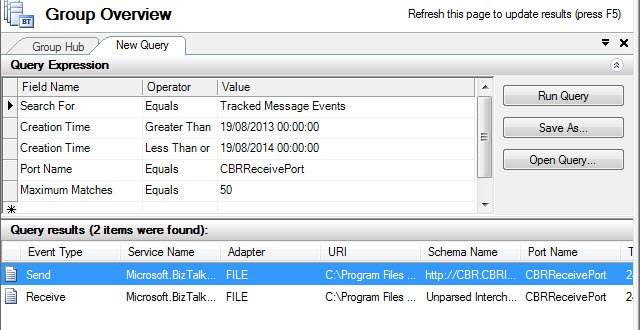 Server Error in '/BizTalk360' Application. This collection already contains an address with scheme http. There can be at most one address per scheme in this collection. If your service is being hosted in IIS you can fix the problem by setting 'system.serviceModel/serviceHostingEnvironment/multipleSiteBindingsEnabled' to true or specifying 'system.serviceModel/serviceHostingEnvironment/baseAddressPrefixFilters'. 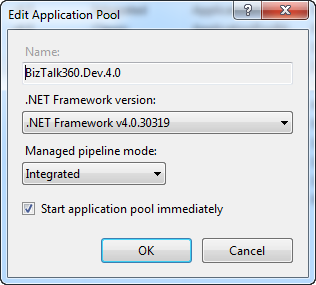 If in case you don't have ASP.NET 4.0 running in the server, then your second option is to create a dedicated website for BizTalk360 with a custom port number (ex: 90) and install BizTalk360 in the dedicated website instead of the default website. You must create the website manually before starting the BizTalk360 installer. The installer will display the options in the drop down box to choose the website. You may have processed lot of transactions during that time, and the above email notification may look like a false alert. Let's take a look at some basic behind the scene concepts and how to troubleshoot this scenario. BizTalk360 process monitoring basically relies on the BizTalk server tracking data to calculate the transaction volume. As a design principle we do not want customers to deploy any custom stuff (like pipeline component, pipelines, BAM artifacts) etc and wanted to take advantage of power of BizTalk server. The same principle is applied for our Graphical Message Flow as well. So, in order for the process monitoring to work correctly the tracking setting in the environment must be working correctly. You can easily check whether the events are captured correctly by executing the following query in the BizTalk Admin Console (with your required settings). If the result of the above query returns no results then you have some tracking configuration problem. Here are the checks you can perform. Make sure Global Tracking is enabled in the environment. 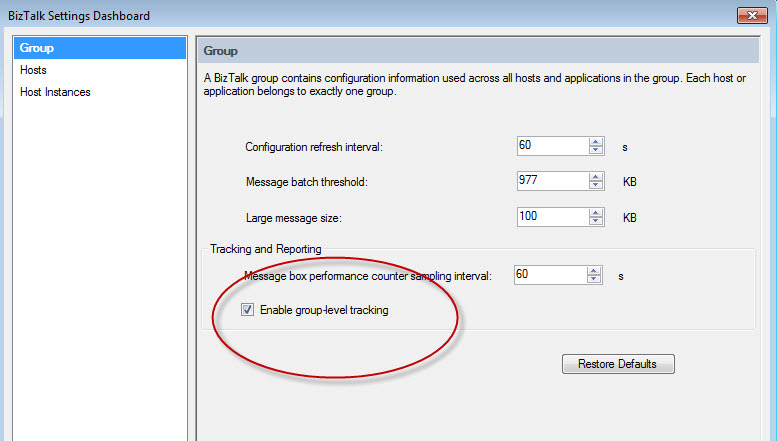 You can do this by checking at the BizTalk Group Settings as shown below. 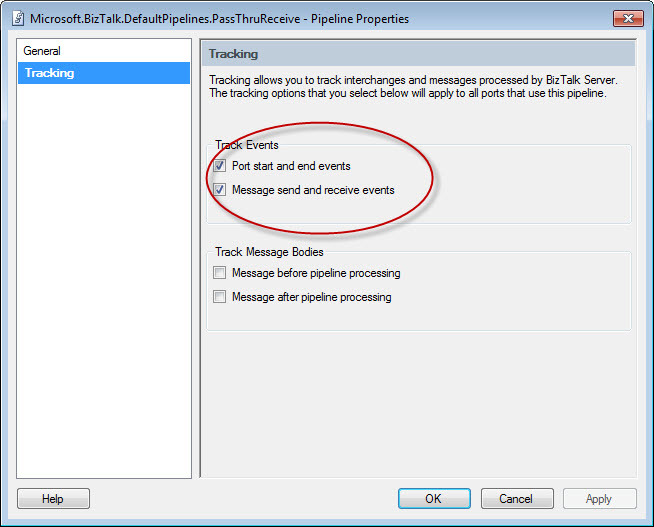 Make sure Event tracking is enabled at the pipelines utilized by the corresponding receive and send port. For example if you are using PassThru pipeline, you can check the following check boxes are enabled. Make sure at least one tracking host instance is running. From the below picture we can see BizTalkServerApplication is the tracking host, we need to make sure at least one host instance is running for this host. System.UnauthorizedAccessException: Access to the path 'C:\Program Files (x86)\Kovai Ltd\BizTalk360\Service\OutboundEmails\Pickup\xyz.eml' is denied. Make sure the service account has the required Administrator privileges. Even after granting the administrative access if you are unable to receive the emails from BizTalk360, it is a problem of unmatched files vs. DB records that is causing the problem due to the permission issue. If you are using LDAP authentication over SSL, you need to make the following changes in the BizTalk360 database to allow BizTalk360 to use SSL for LDAP authentication. Once you have made these changes, BizTalk360 should be able to use SSL for LDAP authentication. Typically what we have seen is we receive a support email, and we follow up requesting set of data from the user or redirect them to our troubleshooting section for known issues/configurations. We actively update our troubleshooting section whenever we see new scenarios, as we know that will come back to us somewhere in the future. So your first point of contact for any troubleshooting issues will be in this documentation. Whenever there is a UI related issue, example the loading screen is spinning forever or blank screen or some error pop dialogue (Bad Request, 500 internal error etc). The best place to look for is open your browser developer tools (F12 or via the menu), navigate to the "Console" tab and refresh the screen. Typically you'll see some RED messages when there is an error. 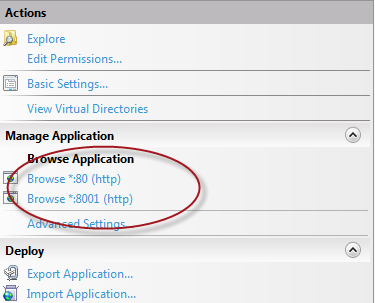 The other place you can look at is the "Network" tab in the browser developer tools, since BizTalk360 makes lot of back end REST calls, if any of the calls fail, it will effect the UI. You can see whether all the calls are running successfully with 200 OK status or if there are any errors. If the error message do not make much sense to you, please take a screen shot and email it to our support email address. We use Windows Communication Foundation (WCF) for our back end API's and we log all the calls using WCF tracing/logging mechanism. Any server side issues will be logged in those files and it will help us to diagnose the problem faster. You can locate 1 or 2 files under the folder \Kovai Ltd\BizTalk360\Web with .svclog extensions. If this is your test environment, rest IIS delete existing files and reproduce the problem, so that the log files will be small and we can identify the problem quickly. 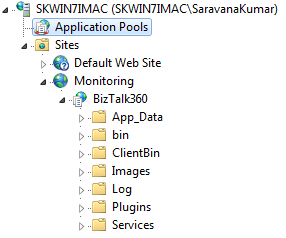 If you experience any problems with BizTalk360 monitoring service example: Message Box Viewer not working, Not receive email alerts, data purging not working etc, then the best place to look at is the log files found under the folder \Kovai Ltd\BizTalk360\Service\Log we segregated each section with it's own log files, so it's normally easy to check for any problems in particular area quickly. You can zip the whole log files folder and send it to us if you experience any issues related to monitoring service. You need to install the patch (Microsoft .NET Framework 4.5.2) as mentioned in the following support article: https://www.microsoft.com/en-us/download/details.aspx?id=42642.The reason for the error is mainly because .NET is not installed in the machine. When you are trying to create a new User Access Policy via the setting link you may encounter the error message "The specified directory service attribute or value does not exist"
This happens because if there is no container specified, the principal context class will create a System.DirectoryServices.DirectoryEntry object by binding to built in CN=Users container to start searching for users. If the user performing the search does not have permission to read the attributes of default users contain, the search operation will fail, thus causing “The specified directory service attribute or value does not exist”, exception. Make sure the IIS application pool identity is not running under a local account and you are trying to configure a domain user. If IIS application pool is running under a domain account, make sure the account have read access on the "User" container. For majority of the cases you will be fine with the default settings, unless the domain administrator has changed the default container (CN=Users) where the user objects are stored. In such cases, it's necessary to specify your user container store, so that BizTalk360 understand where to look for. In order to resolve this issue, you simply add a new setting with key="AD_PATH" and value="" in the b360_admin_GlobalProperties table. If it still prompts for a reboot, it could be because of a pending reboot because of some other software upgrade/install. Follow the steps as shown below to ensure the network connectivity to that counter is available. If these checks are positive, you will be able to view the data for these counters. Restart the BizTalk360 monitoring service to start collecting the throttling data.